Web Shield cannot shield your browsers against virtual security threats, and so we do not recommend installing it on your personal computer. If you have installed the program by accident or without thinking much about it or its activity when bundled with other software, you might have to delete other undesirable or even malicious programs as well. Of course, first you need to remove Web Shield, and we have prepared this report to help you out. 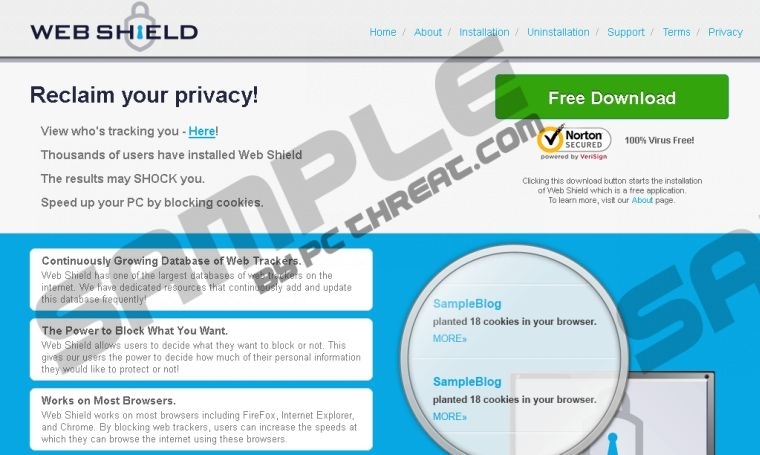 Are you aware of the official download page promoting Web Shield? Webshieldonline.com is not the website that you should rely upon when researching what we identify as an advertisement-supported program. Here the program is identified as a tool that can analyze your browsing history and warn about the cookies, pixels, web bugs, beacons and other technologies used to track information about you. Of course, we would not suggest deleting Web Shield if it was that amazing. Unfortunately, the program displays advertisements, and we identify each of them to be a security backdoor. Our advice is to remove these ads. Do you know how to remove Meteoroids, Blasteroids, Zombie Alert, Zombie Invasion, and other similar ad-supported programs? If you do, you will be able to delete Web Shield as well, because these programs work in a similar manner. It has been discovered that Web Shield has been developed by Irrational Number Applications. It is believed that this is the same company as Ratio Applications, Time Lapse Solutions, Acute Angle Solutions, Creative Island Media LLC, etc. If this were proven to be the truth, there should be no doubts that the company is unreliable, and that the software created by it requires immediate removal. Web Shield is not extremely irritating, because it is unlikely to flood the web pages that you browse with a ton of random ads. Instead, Web Shield is more likely to show ads periodically, which means that the app is more predictable than most of the advertisement-supported programs that we report and show how to remove. Of course, the number of ads displayed does not determine whether or not a program is reliable. We advise deleting Web Shield, because the ads related to the app could be highly misleading. To remove Web Shield from your browsers, you can use our manual removal guide below. Of course, you should not rely upon this guide when it comes to the removal of other computer infections. If you cannot delete them yourself, you should turn to the automatic malware removal software that has been created to delete computer infections like Web Shield and to protect your virtual security against the attacks of other threats. Click the Search button and enter Control Panel. Quick & tested solution for Web Shield removal.